When it's 42 days to go for the launch of the Portugal Trophy, Cascais, the first stage of the 2010 Audi MedCup Circuit, we spoke to Javier Goizueta (ESP), the new GP42 Class President, to learn about the latest news on the teams participating in this year's GP42 Series. “Today, we have five pre-registered five teams commited to complete their entries within the next few weeks: three are Spanish, one is British and one from Italy,” Goizueta says. He faces the presidency of the GP42 Class with an interesting season ahead, where he will combine his new role along with the co-ownership of the GP42 Madrid - Caser Seguros (ESP) together with José María van der Ploeg (ESP). 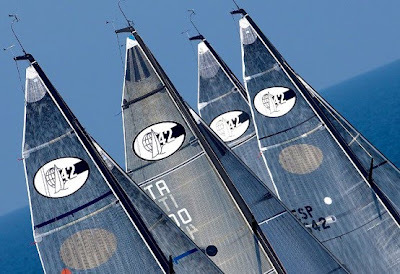 Their 2009 Botin & Carkeek design will face this new season after finishing third overall last year, including their victory of the GP42 Series at the Portugal Trophy. All the pre-registered teams are in their final stages of preparing for the season, with two committed to compete in the Palma Vela regatta (April 14-18) in order to check sails and the changes made to their boats during the winter. One of these is John Bassadone’s (GBR) Peninsula Petroleum (GBR), new into the GP42 Series this year. The British owner bought the Botin & Carkeek ex-Turismo Madrid after competing for the first time on a GP42 during last October’s Puerto Calero GP42 Global Cup in Lanzarote. The other team racing in the Palma Vela regatta will be Roberto Monti’s (ITA) AIRISESSENTIAL (ITA), after making some slight changes to their deck layout, and with some new team members and new sails. Joining these three will be two other boats which have confirmed their participation in the 2010 Audi MedCup Circuit. Both are Botín & Carkeek designs, with one racing last year in Alicante and Cartagena as Iberdrola (ESP), and the other none other than the 2009 Audi MedCup Circuit GP42 Series Champion, Daniel Calero’s (ESP) Puerto Calero (ESP).